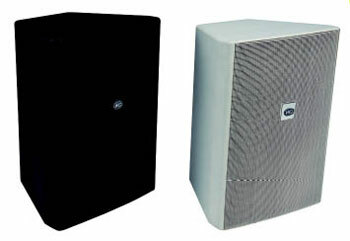 Wall Mountable Outdoor Speaker, Water Proof RS-OWS-WL is a wall mount speaker built-in 70v/100v transformer. The 70v/100v transformer technique reduces line losses on longer distance and allows easy parallel connection of multiple loudspeakers. The built-in 8"+2" two ways speaker driver is designed of wide frequency response 100-16kHz, the RMS 40 watts and MAX 80 watts power outputs are suitable for most of the applications. The metal grille, ABS enclosure and stainless mounting bracket are of black color. Easy and secure wall mount installation through the supplied mounting kit. It is ideal choice for industrial and commercial applications in hotel, school, office and factory where background music and paging is needed.